I was mostly a 3rd Ed. player but I have recently given 4E a good shot and kind of like it as well. One thing I created for my players to help with keeping track of their powers and abilities were cards similar to the listings in the PHBs. It's not an original idea I am sure but I figured I would share it here. I started them in Excel. 1. On the View tab switch to page layout view, makes things a bit easier this way. 2. On the Page Layout tab select paper size and choose 4"x6". 3. On the Page Layout tab select the Landscape Orientation. 4. On the Page Layout tab select custom margins and set all the margins and headers to 0. This will set it to a minimum margin with no header. 5. Set all columns to 2.86 inches. This is done easiest by selecting all the columns and moving just on to that size, the rest should follow automatically and put 2 even columns on each card. 6. Leave all the columns selected and set the font to Arial 14 and click on Bold too. 7. Hit save and leave that set up as your base. Create new cards as needed from here. So say I need to create new power cards for a warlock in my game, She is playing a Fey Pact and following the one outlined in the 2nd Dragon Magazine for maximizing teleportation. I'll do Eldritch Blast as an example but for other powers its done the same with a variation of color. 1. Select the top cell in the two columns on the card. 2. Change the cell's color to the Green that matches the At-Will powers and the font color to White. 3. In the first cell type Eldritch Blast and in the 2nd columns first cell put in Warlock (All) Attack 1. 4. In the next row select those two cells and click the merge and center button and then click the align text left button. 5. I use Tan Background 2 for the cell color. 6. Switch the font for this line to Times New Roman and Italic, type the flavor text or any other flavor text that your player may want instead. 7. I repeat the same as step 4 for the rest of the lines adjusting the cell's height to fit the text and alternate between the tan and white in similar fashion to the power entries in the book. You could set up more of the cards format ahead of time, using a seperate worksheet for At-Wills, Encounters, and Dailys. Then all you would need to do is enter text. I then print them onto 4x6 blank index cards found at any office supply. Wisdom has two parts; Having a lot to say and not saying it. Eliana Toiba Abijah in Isle Noir: Bad Karma. I find it interesting that you decided to use excel for this sort of project. I know there are a lot of other programs people have decided to use--photoshop, etc. There are also a lot of semi-professional options. That being said, your solution does seem very easy to use. "There are shakers, and there are movers. You,sir, are NOT a shaker." Yep, it's an easy solution and I can create new ones pretty fast. I use excel for running my games too so I am always in it during a session. Something I recently found to make them cosmetically look even more like the powers in the book is fading the tan lines. 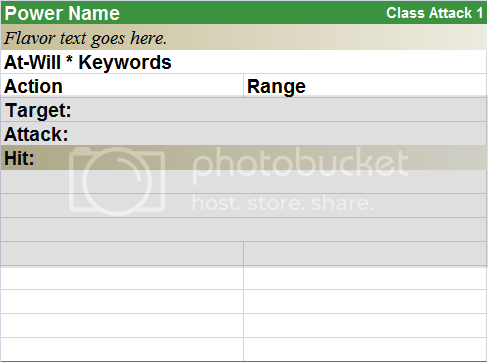 This can be done by right clicking the cell and selecting format cell. In the window that comes up select the fill tab and then the fill effects button. In the new window that comes up select vertical shading style and then to the right of that pick the fade to the right option. Then above that select the colors for the fade. Color one you can either leave as white or select the first tan, and color two select the third tan option which is tan 25% darker. Here is a blank sample of what I have done above. I have left the gridlines showing for illustration purposes but unless you have gridlines set to print in excel they should not be seen.